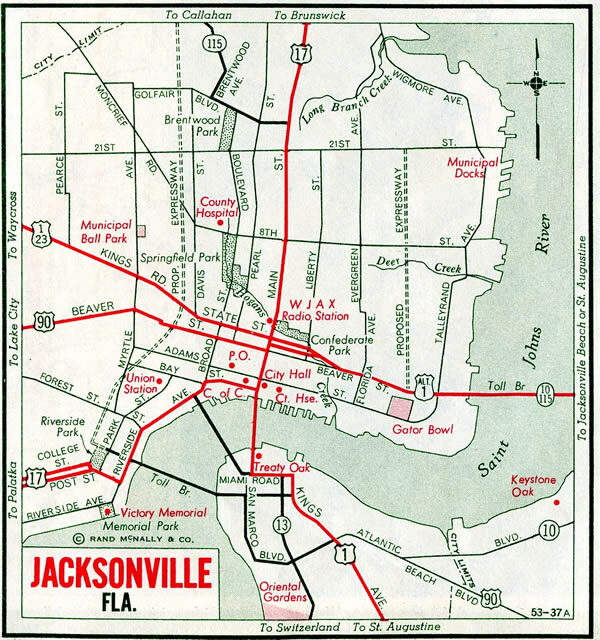 U.S. 1 Alternate forms a 7.5 mile long loop encircling central Jacksonville. The route travels Martin Luther King, Jr. Parkway from Brentwood southeast to Midtown, the Hart Bridge spanning the St. Johns River south to Empire Point, and Emerson Expressway / Street leading west to Spring Park and Englewood. The majority of the route travels along limited access highways developed by the Jacksonville Expressway Authority. State Road 115 represents the hidden component of U.S. 1 Alternate north from the Hart Bridge Expressway to U.S. 1 (Main Street). SR 115 follows MLK, Jr. Parkway west to I-95 north as part of its through route between Lem Turner Road to the north and the Arlington Expressway to the south. State Road 115A, at 1.254 miles in length, links the SR 115 segment of MLK, Jr. Parkway with the SR 228 section of U.S. 1 Alt across the Hart Bridge. The 0.516 mile long Emerson Expressway is unsigned SR 228A and the 1.289 stretch of Emerson Street is cosigned as SR 126. Today Martin Luther King, Jr. Parkway takes U.S. 1 east from New Kings Road (U.S. 23) to Interstate 95 and Main Street (U.S. 17). There U.S. 1 turns south through Springfield as U.S. 1 Alternate begins. 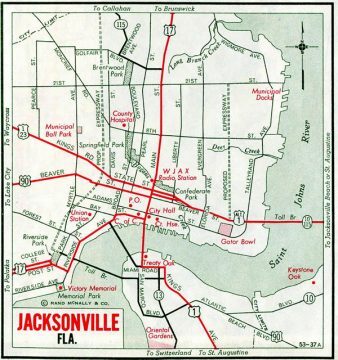 The bannered route continues east to Longbranch and Phoenix, where MLK Parkway turns southward through East Jacksonville to end at EverBank Field (home of the Jacksonville Jaguars), site of the former Gator Bowl stadium. Service roads and a series of slip ramps were built to connect the densely populated neighborhoods along the 20th Street Expressway. A Florida Department of Transportation proposal in 2012 called for the removal of slips ramps both west and east of Main Street (U.S. 17) to address weaving traffic patterns. Ramps joining MLK, Jr. Parkway eastbound from Pearl Street and to Liberty Street and westbound ramps from Liberty Street and to Pearl Street were to be removed as part of a $7.5 million concrete and resurfacing project for summer 2013.1 The freeway was eventually resurfaced, but the ramps remained open. The 21st Street Interchange project was completed in May 2014. It was awarded the DBIA Florida Region Design-Build Honor Award in November 2014. The Hart Bridge Expressway connects MLK, Jr. Parkway with the Isaiah D. Hart Bridge linking Downtown and Midtown with Empire Point and St. Nicholas to the southeast. Tolled until 1989, the bridge carries both U.S. 1 Alternate and Florida 228, though the state road is unsigned. Emerson Expressway transitions into an arterial (Emerson Street) west from U.S. 90 between the Spring Park and Englewood communities. U.S. 1 Alternate crosses paths with Interstate 95 just east of the end at U.S. 1 (Philips Highway). Prior to the completion of the 20th Street and Haines Street Expressways, U.S. 1 Alternate combined with U.S. 90 Alternate along Arlington Expressway and Mathews Bridge between Midtown and Southside Boulevard. Southside Boulevard then took U.S. 1 Alternate south back to U.S. 1 near Greenland. Signs for Phoenix Avenue on U.S. 1 Alternate south were replaced by 2014 to reflect the new connection from the off-ramp to 21st Street and Jaxport Talleyrand. Photo taken 07/04/06. 2011-14 construction both reconfigured the diamond interchange with Phoenix Avenue and smoothed the 90 degree turn of MLK, Jr. Parkway to the east. Photo taken 06/14/08. The original curve south from the original 20th Street Expressway to Haines Street Expressway required motorists to slow down to 35 miles per hour. Photo taken 06/14/08. Flashing beacons and regulatory signs accompanied the reduction in speed at the U.S. 1 Alternate turn. Photos taken 07/04/06. A tall barrier median was added to improve safety at the pre-2012 curve of U.S. 1 Alternate south by Henry L. Brown Kooker Park. Photo taken 06/14/08. Crossing over the Talleyrand Terminal Railroad spur along the 1961 alignment of U.S. 1 Alternate south. An off-ramp formerly departed for 11th Street ahead. Photo taken 07/04/06. The surface of MLK, Jr. Parkway at the 11th Street under crossing is now entirely concrete. Overheads replaced ground level signs for forthcoming 8th Street by 2014. Photo taken 06/14/08. Replaced overhead for Haines Street south to Jessie Street on U.S. 1 Alternate in East Jacksonville. Photo taken 06/14/08. Signs for the upcoming split U.S. 1 Alternate with Florida 115 (MLK Parkway) were replaced to show Hart Bridge in place of Jax Beaches and I-95 instead of U.S. 90. Photo taken 06/14/08. 2015 sign changes at the U.S. 1 Alternate and Florida 115 separation added 3/4 mile for SR 115 and increased the font size for Mathews Bridge. Photo taken 06/14/08. A new overhead assembly replaced this fixture at the Haines Street southbound ramp to U.S. 1 Alternate (Hart Bridge Expressway). Photo taken 07/04/06. All yellow traffic lights formerly at U.S. 1 Alternate & Florida 126 (Emerson Street), I-95 south and Gallion Road. These were replaced with mast-arm assemblies by 2011. Photo taken 07/04/06. "Change Coming To MLK Parkway?" Metro Jacksonville, November 7, 2012. "Work begins on new interchange at Martin Luther King, Jr. Parkway and 21st Street." Jacksonville Port Authority, news release. February 15, 2012. Historic Highway Bridges of Florida. Sarasota: FDOT, 2012. Print. "Call Box: Hart Bridge has a distinctive history and a heady aroma." Florida Times Union (Jacksonville, FL), June 28, 2013. 07/04/06 by AARoads and Justin Cozart. 06/14/08 by AARoads.